“In a world where everything is upside down and nothing is certain, you can still rely on the fact that if you whip chocolate with cream, it will get thick”. Or words to that effect. This quote from that well-known film about post-industrial political crises – Julie and Julia – rang true this week. (If you don’t know this film, it’s actually a light-weight comedy about the American food writer Julia Child.) Since last week’s vote myself, all my friends, all my colleagues, are glued to the news sites. Politics has never felt so real, so compelling, so important. All those who have claimed that Politics is Dead have shown themselves to be sadly misinformed. Great Britain have weathered crises before, and so shall we now. If the turmoil of this week is a shock, then imagine what it is to watch your country disintegrate to such a level that your money is lost overnight, you must abandon your home, leave your family: that’s the daily reality of many people in this world. Some of them appeared on Farage’s infamous campaign poster… just food for thought. Amidst the upheaval, we can at least find comfort in food. Or at least cooking. This may sound crass but actually, I think the will to break bread with your neighbour is one of the most powerful political gestures that can be made. Food is a compelling cultural symbol and it can break-down barriers. Are we not the country that has embraced curry? Croissant? Burgers, pasta, pizza, couscous…dammit even pomegranate molasses. The Brits absorb food cultures and turn them into something new, and are all the richer for it. Let’s keep on looking outwards rather than looking in. 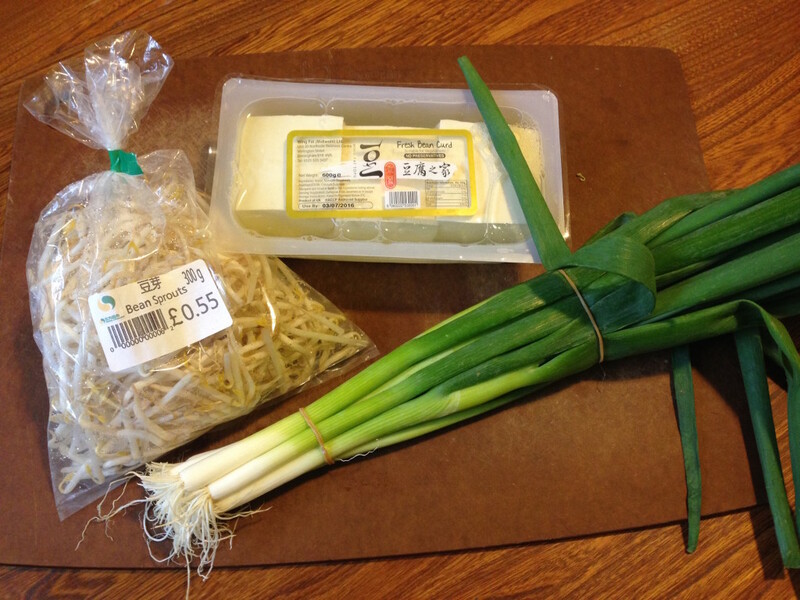 This week I popped to the Oriental Supermarket (it is actually called that) and picked up a few goodies – super-long spring onions, beansprouts, noodles and tofu. TOFU?! Yes, I used to think it was disgusting too, but then I learnt to deep-fry it and turn it into Pad Thai. Pad Thai is a stir-fried noodle dish from – you guessed it – Thailand, which is rich with omelette, tofu, chicken or shell-fish and drenched in a tamarind-rich sweet & sour sauce. Food writers often describe Pad Thai as being ‘quick’ and ‘easy’. To be clear, it is neither. To make Pad Thai is a faff, requiring thousands of ingredients, but it’s worth it because it’s so damn tasty. My version of Pad Thai. It is not authentic by any means, but it tastes good. I use a recipe that I’ve bastardised from The Hairy Bikers – I’ve never been to Thailand so make no claims to authenticity, but I do make claims for deliciousness. Authentic Pad Thai has pickled turnip in it and very few veggies – if you’re interested in the real deal, take a look at this post on Use Real Butter. First, make your omelette. Whisk 2 large eggs with 1 tbsp Thai fish sauce and a few slices of spring onion. Heat an omelette pan with a splash of sunflower oil, slide in the eggs and cook gently until firm. Set the omelette aside on a plate to cool, then slice into strips. Next, prep your tofu. I use 1 packet of firm tofu. Wrap it in kitchen paper and place it underneath something heavy for five minutes to drain – a can of beans or similar – and then cut into cubes. Heat a wok with several centimetres of sunflower oil and deep-fry the tofu until browned – you may need to do this in batches. Drain on more kitchen paper. Don’t miss this step as it makes your tofu change from ‘yuk’ to ‘yum’. Drain the hot oil from your wok and clean out any burnt tofu bits, ready for stir-frying. Next prep the veg. Slice 1 banana shallot, chop 2 cloves of garlic, slice 1 lemongrass stalk and 2 red chillies and grate a knob of fresh ginger. If you like green things, as I do, you could also slice a few broccoli florets, spinach leaves, courgette, or anything with a bit of crunch. Get ready a handful or two of beansprouts, some fresh basil and maybe some coriander. The recipe goes on. Let’s make our sauce: stir 2 tbsp of Thai fish sauce with 2 tbsp soft brown sugar (or palm sugar if you have it), 1 tsp tamarind paste and a splash of hot water. At this point you could also prep some raw king prawns or slice a chicken breast. Or simply keep it veggie. Now let’s get cooking. Get your wok on a high-heat, slosh in some sunflower oil and toss in the shallots. Stir-fry for a few seconds before adding the ginger, chilli, lemongrass and garlic. If you’re using chicken or prawns, add them now and cook for a minute or two, until nearly cooked through. Add the rest of the vegetables, keep the heat high, stir and cook until they soften slightly, then pour in the sauce, letting it bubble up. 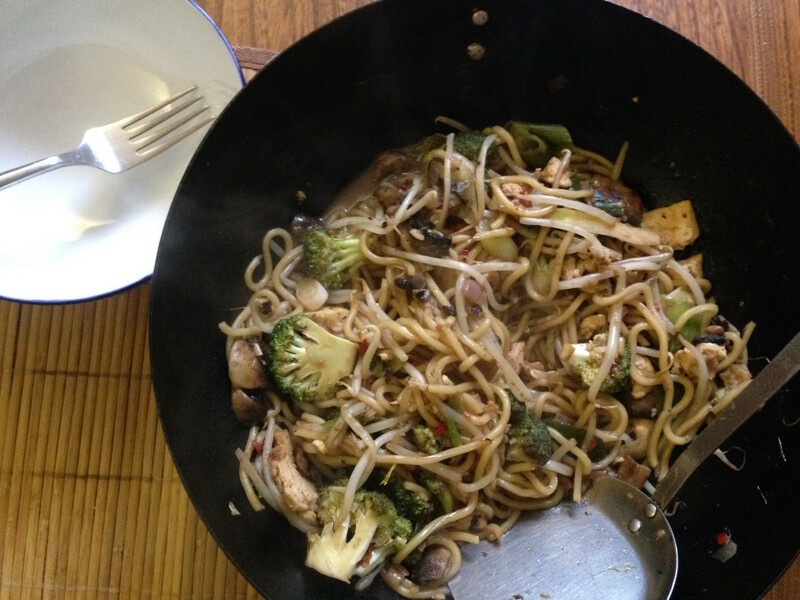 Gently stir in the tofu, omelette and noodles, and cook through for a minute or two until it looks ‘done’. Stir in the herbs right at the end. Serve up your Pad Thai straight away with a few slices of lime and perhaps some chopped roasted peanuts, for crunch. This entry was posted in Recipes, Savoury. Bookmark the permalink.